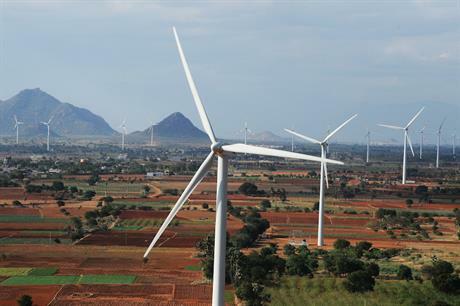 INDIA: Siemens Gamesa Renewable Energy (SGRE) has won deals to provide 163 turbines across 26 wind farms across the country. The unknown sites are due to be commissioned by March, the company added. SGRE said the orders signal a "turnaround" in the country, after a difficult year for the wind industry in India. Ramesh Kymal, CEO of Siemens Gamesa’s onshore business in India, said: "These orders show a positive sign of development in the market and it certainly boosts our confidence significantly as we gear up towards the next growth phase for Siemens Gamesa in India." Last year’s downturn in India followed the country’s first reverse auction in February, in which tariffs fell to INR 3.42/kWh ($0.052/kWh) — below the rate of feed-in tariffs (FiTs), which ranged between INR 4/kWh and 6/kWh ($0.06-0.09/kWh). Most states discouraged or stopped FiTs after the fall in prices in February’s auction. In May, Siemens Gamesa had blamed a fall in sales due to the "market shutdown" in India, but with the government’s plans to auction up to 6GW of new capacity in the first half of 2018, its hopes for the country have been revived. The company stated: "A clear auction calendar such as the above is certainly a welcome move and is quite encouraging for the industry at this point in time and will accelerate capacity additions. "Siemens Gamesa expects the Indian market to stabilise in 2018 and fully recover in 2019."